For week seven, I have some inserts for the PL album, and the great thing about Project Life is they have a bazillion different pocket page configurations to fit every conceivable picture size. If you haven't checked out the App yet, they have so many different page layouts there also. Win, win! This page was made for part of the SC Challenge "Spread the Love", and personal journaling can be inserted in the back and fit in your family PL album. Love the 6x12 size!! Just added watercolor squares, last bits from January SC PL kit (Far Far Away), the chipboard words and pink hearts, gold sequins, and vinyl aqua hearts stickers, and used the Feb. SC PL kit Cirque stamp, "Love", and the rose gold strips cut into banners. The modern rose shapes were cut with my Cricut. Love that Project Life works and fits into whatever you want it to be. 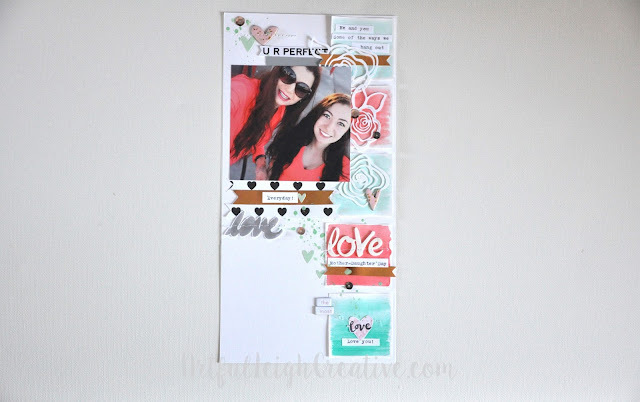 People do weekly, monthly, inserts, full size scrap pages, it's endless people, endless possibilities! I LOVE THAT.